Through the Russianized towns, subzero temperatures and sandy deserts of Mongolia's far west. Uulgii, southern Ulaangom Province, just before sunset. The small minivan that brought me there at my shadow's end. Those halcyon days in Tsetserleg and its hills were over. What a time it was there: friendly people, perfect natural wonders. A true sense of travel that I’d been striving for for some time. But time was running out. I wanted to get to Tariat - a town about 130 kilometers to the west. I’d heard from there, continuing further westward would be much easier. So I packed up my gear, said my farewells to a staff in my Tsetserleg homestay I’d come to be familiar with, and headed to the main road. I was told a bus would be leaving 9 hours later. But I didn’t want to wait 9 hours. Heading to the main market in the center of Tsetserleg, I simply stuck my thumb out and hoped for the best. Within 2 minutes, I was invited into a minivan occupied by the friendliest family I could imagine. The three little ones rode down the back with me and their Grandpa, taking turns sitting on his lap. Mum and Dad were up front, continually passing back biscuits and fruit, which I was also offered and gratefully accepted. We stopped for a picnic in the sunshine. The children ran up a small hill and rolled back down and then did it again. The grandpa laboured to take a knee. Mum and Dad took a breather from there ceaseless parenting. I lay on the grassy, open wilderness we’d paused at, shone my Granny Smith apple and my shirt, and took a bite, basking in all the majesty of that precious moment. Tariat was a sad place in many ways. Having left the virtuous Tsetserleg, it felt a depressing little settlement. 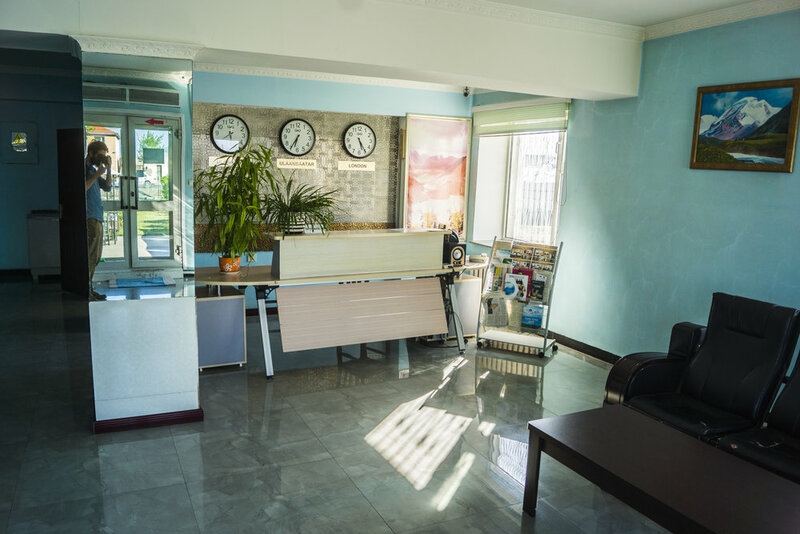 I found Tunga Guesthouse on the fringe of the town, and sorted a room. I had an idea I could just keep hitching west. But Tariat was freezing. And when I arrived at the guesthouse, I saw two French hitch-hikers who were in a predicament: they simply couldn’t find rides. My horse guide in Tariat. Traffic out in the west is far less frequent. Hitching is still possible, but it is a long and slow process. The forecast was for days well below zero. The prospect of waiting on the highway in the subzero winds was unappealing to me. A bus would come two days later and continue west. So I made the decision to stick it out in Tariat and hold tight ‘til the bus came. The countryside near Tariat on the coldest morning I've faced all year. Around -10 degrees when this was taken. Tariat itself may be miserable. But its surrounds are, like the rest of Mongolia, incredible. I even hired a horse one afternoon to trot to a nearby lake. Horse riding in Mongolia is thrilling: the wide open spaces offer great views and the horses know the territory intimately. I hadn’t ridden since I was a kid, and it felt great to bring my horse up to a steady gallop on the open, grassy plains. I was soon joined in Tariat by Stephen, a young Austrian who I’d met in Tsetserleg. He’s traveling from Ulaanbaatar to Innsbruck on a Puch Maxi - a tiny, 50cc scooter which is no more than a lawn mower engine strapped to a bicycle, with a top speed of 45 kilometers an hour. One day we were in Tariat, it was unbearably cold, around -10 degrees at its worst, and never rising above freezing point. It was too cold to even walk to one of the three small shops in town to buy a hot cup of noodles, though we eventually laboured through one such outing to appease rumbling bellies. Two nights after arriving in Tariat, the bus finally came. It was a bizarre scene: I was waiting at a service station in the dead of night. It was freezing cold, pitch black, and foggy. The bus was very late, leaving me with a suspicion it had come early and I’d missed it. I was just about to walk the 5kms back to the guest house when I saw headlights on the horizon. Soon, the bus pulled in through the fog, the doors swung open, and the comically-uniformed team of drivers frantically ushered me onboard. My seat was at the very back. This is where the drunks sit, too. I nestled in amongst them, and after one or two strong bowls of vodka, attempted to get some sleep. The bus rolled over open plains for much of its journey to Ulaangom. In much of Mongolia, the roads are just so deteriorated that its safer to drive on open grasslands. When the sun rose, I was surprised to look out the window and see no road in sight. After 16 hours on board the drunken bus, I stepped off at Ulaangom, a tiny town I’d tolerate for a night before jumping on a minivan the next morning to Khovd - my gateway to China. At the edge of Khovd, in far western Mongolia. My original plan had been to continue northeast into Russia and tack back south, entering Kazakhstan from Novosibirsk after a few sunny days hovering around Lake Baikal. Russia’s visa rigidity (it would have taken around 2 weeks of waiting in Bejing for a visa) ended that plan. The only other route? Through China’s far western Xinjiang province. I'd been stuck in Khovd for two days. Arriving late on a Friday, I'd have to wait out the weekend in what could be described as Asia’s most unexciting city, before heading to Bulgan -- a town on the China/Mongolia border -- late Sunday for a Monday morning crossing. I walked to the bus station near Khovd’s black market, and found a small van with ‘булгана’ printed on the windshield. The driver was in no hurry- he wasn't heading to Bulgan for another six hours. I saved my spot, and trodded off back to the Tsambgarav to wile away another afternoon. I'd enjoyed my time at the Tsambgarav. It was utterly tacky. Its faded blue facade was matched by the ugliest interior you could imagine. Its totally vacant staff added to the comic atmosphere of the hotel. Its time must surely be coming to an end - Khovd is no paradise, but new hotels are springing up. I think the Tsambgarav has run its course. Returning to the asphalt, open air bus station, I squeezed in by my seat mates. Our knees interlocked and my arms numbing, I tried to speak. More than usual, I was receiving no response. Soon I realised: all 9 other passengers were deaf. Somehow, our communication was better than I experienced with other Mongolians. Our dialogue - in sign language, mixed with translated words on our phones - seemed more vivid than any other conversation I'd had with locals. We talked about my travels so far. The group were heading to Bulgan and on to China for a conference of some description. But for most of the travel, I was the deaf one, unable to engage in the rich exchange unfolding in front of me for the best part of 6 hours. 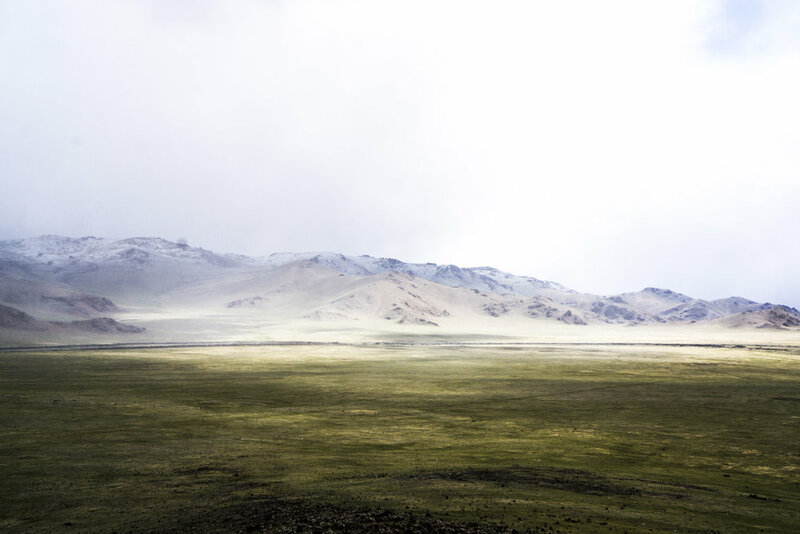 Mongolia’s far west is a desolate place of sand and rock. A new road now links Khovd to the Chinese border, cutting the commute from 12-14 hours to just 6. We left at 5pm, and drove past open desert, rocky hills and Bactrian camels before arriving at Bulgan at around 11. I settled in to the one hotel in town. By this stage frustration had got the better of me. I have no money on this trip, really. The challenge of finding cheap accommodation is amplified in tiny remote communities with no surplus of beds to go around. It sounds absurd to the moneyed back home, but I was getting tired of forking out $20 a night for hotel rooms. They're soulless, expensive and isolating. $20 is a big deal in this part of the world. To sacrifice it for nothing more than a stiff mattress and a roof was becoming an irritation. I was thankful it would be my last night for some time thrust into the bowels of an unwelcoming, overpriced inn. 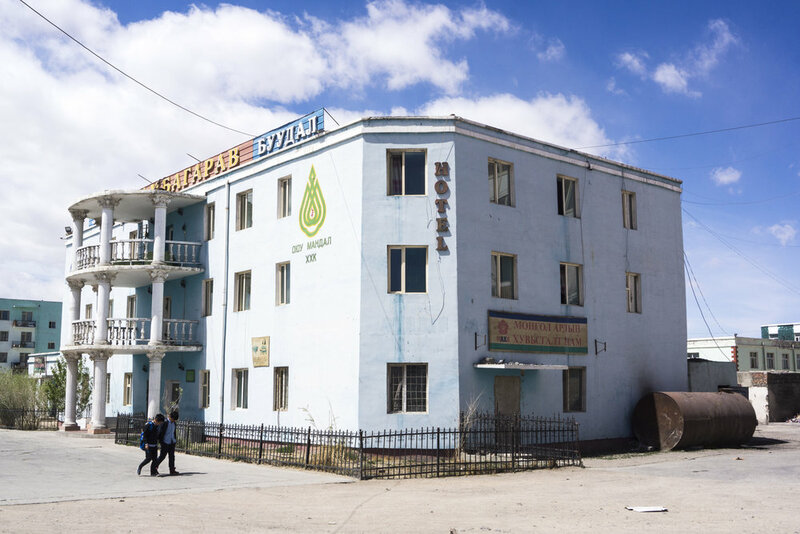 China promised a return to affordability; in Central Asia, accommodation is next to free. Breakfast was a snickers bar. There's little perishable food in these small remote Mongolian towns. I hunted for a ride to the border, 44 kilometers to my east. Bulgan is a different place - half its population are ethnic Kazakh. They look and dress differently to elsewhere in Mongolia. They’re muslim, mainly. 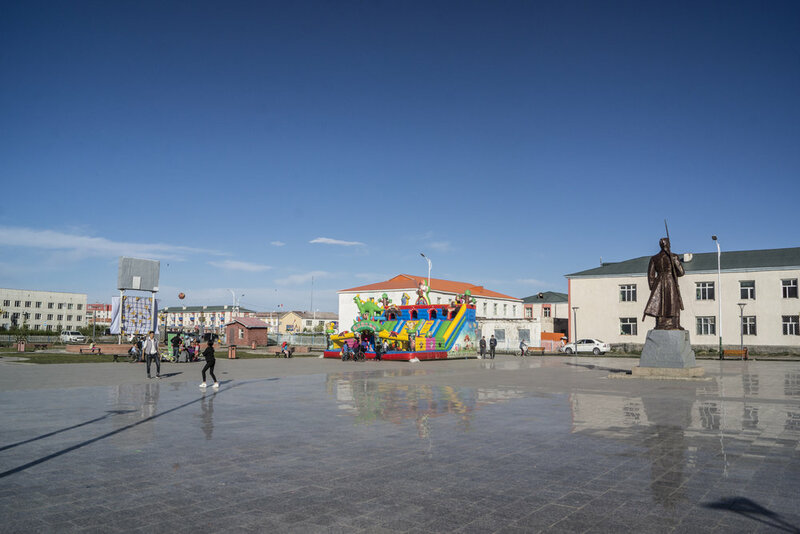 Even the layout of the small town seems less Soviet and more distinct, unlike elsewhere in Mongolia’s west. I asked a random man for the “avtobus veh China”, and he guided me to a local driver, who took me to Mongolia’s end as the radio blasted the last of the Mongolian throat-singing I’d hear.